On July 31, 1968, a young African-American boy was looking at the newspaper when he saw something that he had never seen before. With tears in his eyes, he started running through the house, calling for his mom. He would show his mom, and she would gasp, seeing something she thought she would never see in her lifetime. Throughout the nation, there were similar reactions. What they saw was Franklin Armstrong’s first appearance in the iconic comic strip Peanuts. Franklin was ‘born’ after a school teacher named Harriet Glickman, had written a letter to creator Charles M. Schulz after Dr. Martin Luther King, Jr. was shot to death outside his Memphis hotel room in April of 1968. Glickman, who had kids of her own, and having worked with kids, was especially aware of the power of comics among the young. ‘And my feeling at the time was that I realized that black kids and white kids never saw themselves depicted together in the classroom,’ she would say. 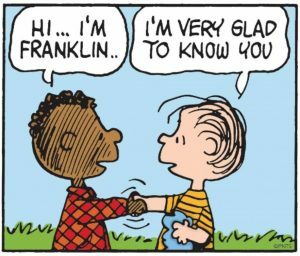 Glickman asked Schulz if he would consider adding a black character to his popular comic strip, which she hoped would bring the country together and show people of color that they are not excluded from American society. She had written to others as well, but the others feared it was too soon, that it may be costly to their careers, that the syndicate would drop them if they dared do something like that. Charles Schulz did not have to respond to her letter. He could have just completely ignored it, and everyone would have forgotten about it. But, Schulz did take the time to respond, saying he was intrigued with the idea, but wasn’t sure whether it would be right, coming from him. He didn’t want to make matters worse. He felt that it might seem condescending to people of color. 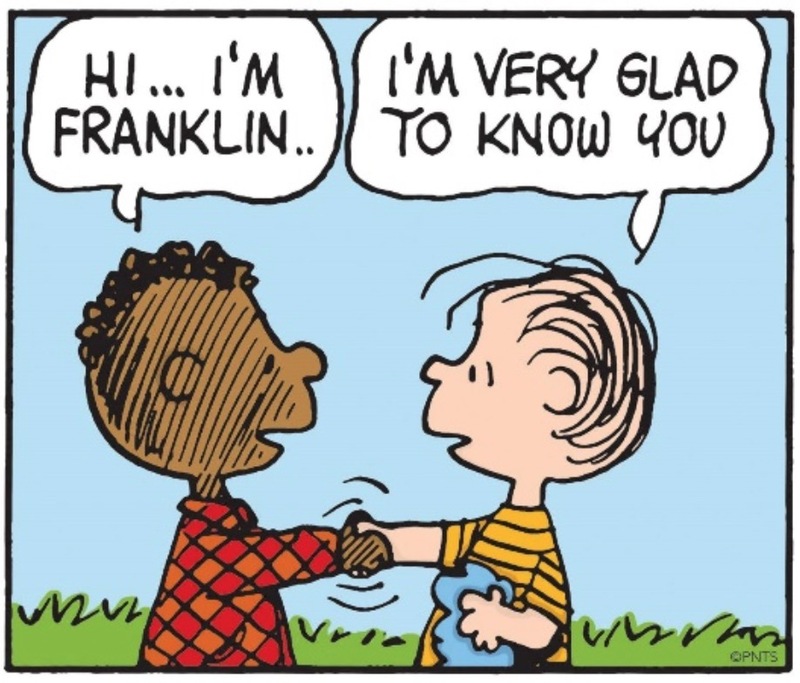 Eventually, Franklin became a regular character in the comic strip, and, despite complaints, Franklin would be shown sitting in front of Peppermint Patty at school and playing center field on her baseball team. Because of one brave school teacher who decided to ask a simple question, and because of one artist named Charles Schulz, people around the world were introduced to a little boy named Franklin.